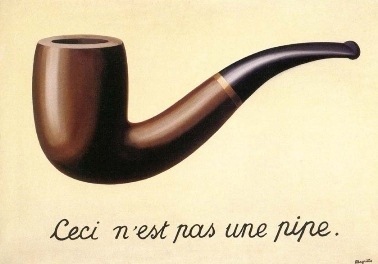 The concurrent coincidence of opposites: the pipe is not a pipe. Why? If it were a pipe, you could take it in your hand, feel its weight, its balance & its texture. You could fill its belly with tobacco, & muse about Being & Nothingness in the fading light between intermittent puffs. Magritte merely suggests a pipe through amalgamation of oil colors & artistic genius. The representation is symbolic. In just the same way, pixels on your LED screen refer to Magritte’s original. In our lives, we weave a web of symbols—a tapestry so intricate that we become enthralled by the images of the wonderous weft wrought of our own imaginings. We take them to be substantial. We think symbolic fabric will support our actual weight. Then we fall out of our hammocks—reality rudely awakes us from our dreams. Our conventional experience, towering in magnificent metaphorical majesty, appears to us even stouter than a hammock; so solid as a great cathedral. We ascend the stairway of this impressive edifice, climbing to the bell-tower that we might enjoy a grand vista from its pinnacle. Then something happens: the wind changes & we suddenly apprehend the horrible truth that this lofty monument is built of no sterner stuff than figments, held together by the mere mortar of symbolic references. How solid, I wonder, is the idea of a stone floor compared to the ground itself? Given this subtle disconnect between the world & our ideas of it, it is no wonder we tend to walk around in states of tension, as though one misstep would send us into free-fall through the endless void. We never feel the earth beneath us—we know it’s there because we learned that when we were children & now we subsist on memories. Conventional adulthood means that we rarely touch the world, but rather interact with it only indirectly, through our acquired beliefs, expectations, preconceptions about it. Our brains all too willingly embrace their own imaginings. But our bodies suffer (not to mention our more intangible aspects). One would never expect her body to subsist on restaurant menus without the bread to which the former refer. Sensory experience is form of corporal nourishment; that’s why sensory deprivation is torture. But when was the last time you felt the texture of the doorknob when you made it home on a Thursday night after a full day at work? If you’re like me, by the time your fingers find it, your mind is already inside hanging up your coat. So through interminable mental proliferation the body starves & we float around like disembodied spirits, not fully in the world. & that here is where you belong because it’s where you are.